Canon unveiled three PIXMA printers that come with innovative functionality for consumers and business users. The PIXMA MG7720, MG6800 and MG5700 series are all-in-one printers with print, scan and fax capabilities, but they also come with new cloud integration. For consumers, the PIXMA Cloud Link allows you to print images directly from your Instagram account or public images from feeds you follow. This functionality is built into the printer, and you don't need to connect a computer, tablet or smartphone for direct Instagram printing. Similarly, business users can enjoy SlideShare printing. Scanned images can also be directly uploaded to OneNote from the printer as well, so you won't need to connect your PC. All models can print and scan directly to "to several of the most popular online social platforms and services, such as Facebook, Twitter, Flickr, Photobucket, Dropbox, Evernote, Creative Park, Google Drive and Microsoft® OneDrive," said Canon in a statement. Canon claims that the new printers are up to 30% faster than the models that they replace, and the new models come with a better experience for printing from a smartphone or tablet with the updated Canon PRINT Inkjet/SELPHY mobile app. 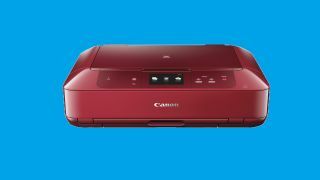 "Each printer features Auto Power On/Off functionality, Auto Two-sided Print and PictBridge printing via wireless LAN for a direct connection to select Canon Digital Cameras," said Canon. The printers come bundled with Canon's My Image Garden software to help users enhance, edit and share their photos. The MG7720 is the flagship model in Canon's PIXMA lineup. The PIXMA MG7720 features a 3.5-inch touchscreen with Canon's touch UI to help you navigate the menus. The model features six individual ink tanks that Canon claims can produce "photo lab quality photos at home and professional looking documents." The printer is available in black, white, gold and red for $199 (£127, AU$269). As the mid-range model, the Canon PIXMA MG6800 comes with a smaller 3-inch touchscreen, five-tank ink system and versatile dual purpose paper tray that can accommodate plain paper and photo paper. Borderless 4 X 6-inch photos can be printed in 41 seconds with the MG6800. The MG6800 series comes in several different colors. Unlike the MG7720, Canon made this series extremely confusing by giving each color its own model number. The MG6820 will be available in white and black, the MG6821 will be available in a black/silver trim and the MG6822 is available in a white/silver trim. Each model will retail for $149 (£95, AU$202). As the entry model in Canon's new PIXMA series, the MG5700 features a similar five-ink tank system as the MG6800 Series. Students looking to reduce paper costs can configure the MG5700 for automatic duplex printing. As part of the series, the MG5700 is available in black and white, the MG5721 in a black/silver and the MG5722 in white/silver, with each model retailing for $99 (£63, AU$134).